I was recently contacted by Chairish, an exclusive curator approved, online marketplace for vintage furniture. I checked out the site and was really impressed. I am anything but an antique or vintage shopper and would most likely never find a gem at a thrift store and this site takes out all the guess work. Since everything is approved by Chairish's curators, you can feel confident you are buying a real quality name vintage piece of furniture or decor and not a someone's random craigslist cast off. 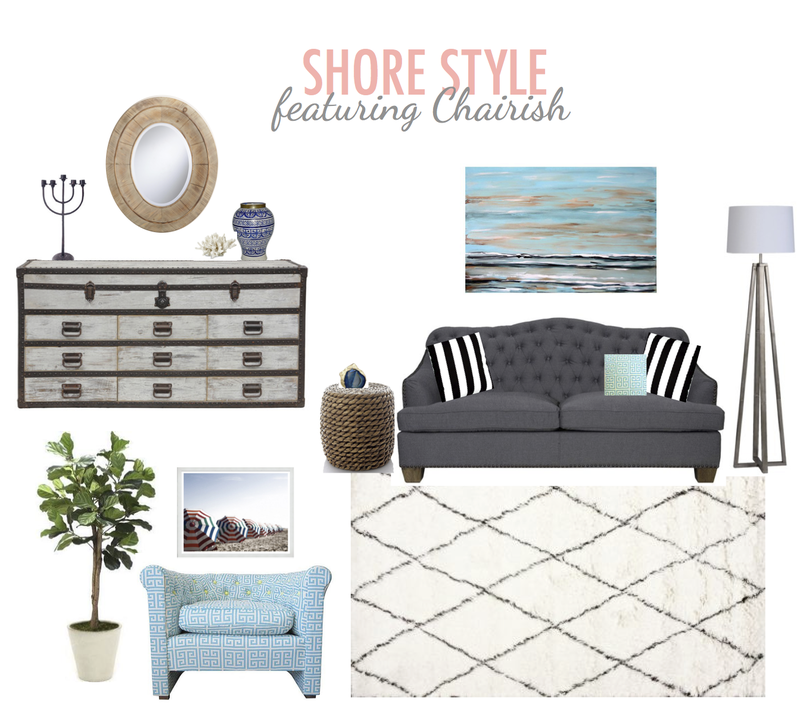 Chairish challenged me to step away from basic neutrals and go bold by sharing a styleboard around an accent chair taking a room from white to bright. 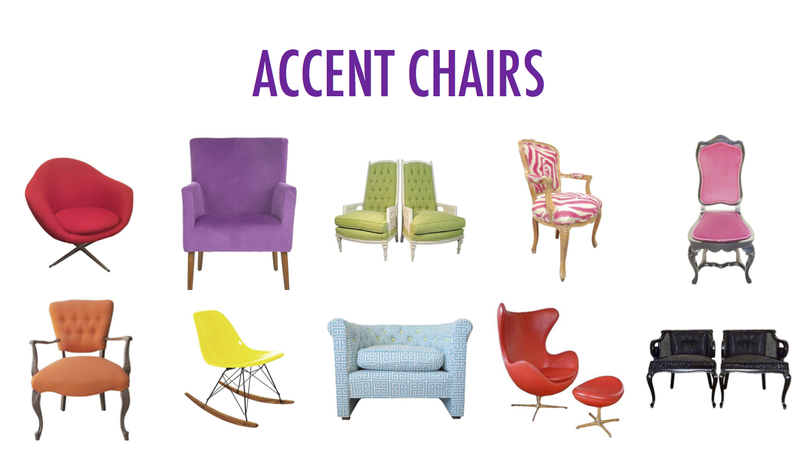 I was given a selection of actual Chairish curated chairs to choose for my project. The styles ran the gamut from victorian to mid-century modern. No style period or (BOLD!) color was left out. I ended up choosing a turquoise barrel chair with a greek key pattern upholstery. It's tufted buttons are even a bright neon, this chair is anything but subtle. However, my usual design esthetic is! I love breezy whites, light greys, tans, and grounded black or navy. Cool hues of blues are always where my eye is drawn, and natural earthy greens. A girl from the ocean, it's just in my blood! I started a styleboard and immediately realized I was failing the challenge! I was going with my tried and true breezy shore style, but since I still felt I was able to incorporate this fun and eclectic chair, I wanted to share what I came up with. After going back to the drawing board, I realized it wouldn't be "me" to come up with some crazy modern and bright room, so I swapped some of the more neutral and safe items for others with more color and punch. So similar style, just with the color dial turned up! A lot of the items included are pretty affordable and either found at Target, Joss & Main, Rugs USA, and One Kings Lane (some are currently available now!) We actually have the Mayes Bookshelf in our family room, and love it's look. I'm also dying for a art piece by Jennifer Latimer or a Thom Filicia print for our own home. Chairish has a great selection of decor items and artwork as well, and you can even shop by your city to see what is local to you (for free pick-up). 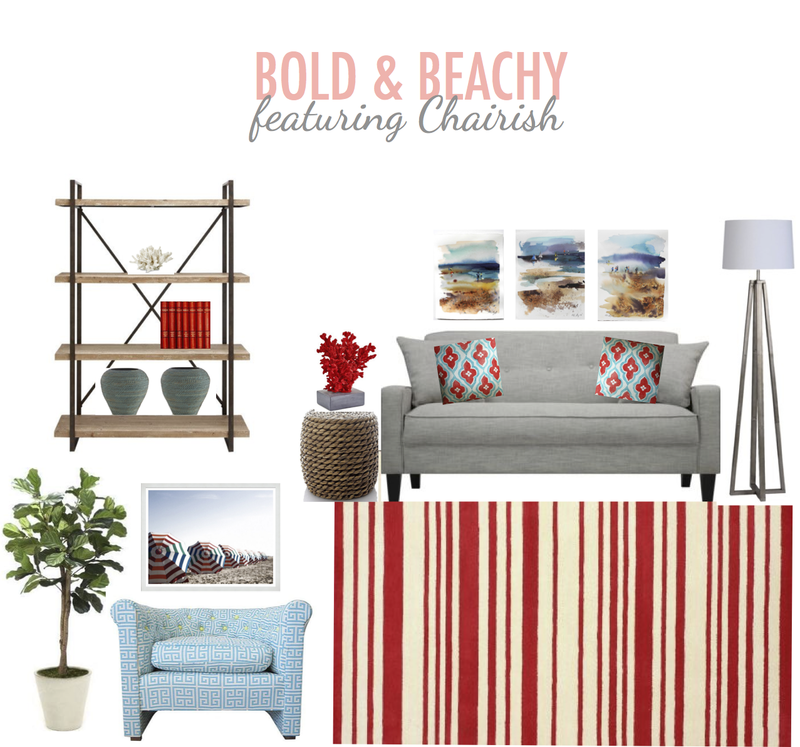 And for FTC disclosure purposes, this post wasn't sponsored (paid or perked) in any way by Chairish, I was just asked to create a styleboard for them using one of their bold chairs and really fell for their site's mission. Definitely helps the non-vintage shopper in me feel better about buying pre-owned pieces! However, if you would like to save $20 off an order of $100 or more or other perks, sign up for their VIP List. Which style do you like better?? I need to figure out how to get a fiddle leaf fig in my life! Loving the couch in option one - that's the one I lean towards as well! wow! both these boards look great!